Danish firm BIG has released visuals for a new baseball stadium in Oakland, California, and a separate masterplan to redevelop the city's Coliseum sports ground. The ballpark will provide a new home for the Oakland Athletics Major League Baseball (MLB) team – also known as the Oakland A's sited at Oakland's harbourside Howard Terminal. The stadium design includes an undulating roofline topped with a grassy park, which will offer views of the water and street below. 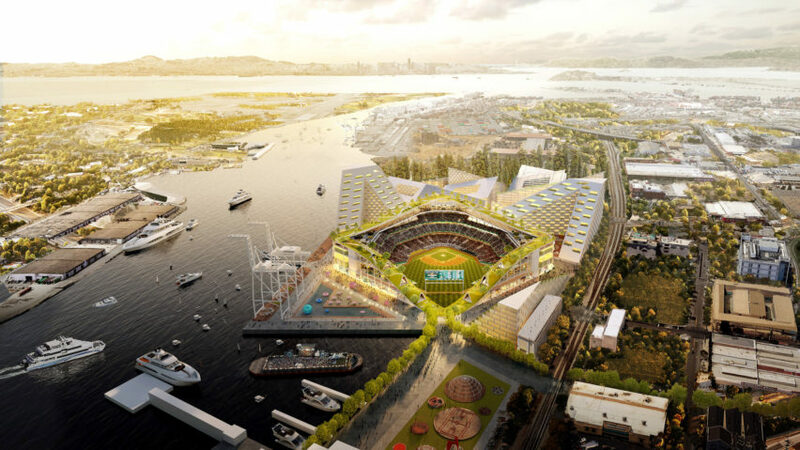 "Our design for the A's new home at the heart of Oakland's revitalised waterfront seeks to return the game to its roots as the natural meeting place for the local community," said BIG founder Bjarke Ingels. Stadium seating for 27,000 will rise up the angled sides of the structure, framing the bowl and bringing spectators as close to the home plate as possible. On top, the elevated park – complete with trees and a winding pathway – will provide standing space for 10,000 additional fans, and meet the ground at the waterfront. "We are bringing the 'park' back in 'ballpark'," said Ingels. "An elevated treelined promenade frames the ballpark on all sides, dipping down to meet the public square, and open the field to the water and city views." Triangular buildings will be constructed to face the remaining three sides of the stadium. Behind, a series of lower structures will feature similar shapes and slanted rooflines – altogether housing a diverse programme will include space for new cafes, shops, offices, gyms and residences. "The square block sits neatly within the extended urban fabric of Oakland, transforming concourse into street and concessions into restaurants," said a project description from BIG. "We ensure the ballpark, and the park that sits atop it, is active even on the 284 non-game days." 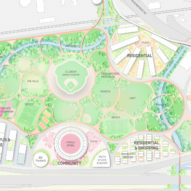 The studio's plans for the Bay Area city also include the redevelopment of the existing Oakland–Alameda County Coliseum – a 20-minute drive south of the new stadium site, where the A's currently play. The Coliseum area will be redesigned with sports areas, and residential and educational developments, while paying homage to its athletic history. "The Oracle Arena will be repurposed as an events centre, while the field of the Coliseum will remain as a vestige of the previous era – with the lower bowl integrated into the landscape like an ancient amphitheatre," BIG said. The existing below-grade baseball field will meet a grassy area, with a handful of soccer fields and courts completing the park area. Two residential complexes and a shopping development will be built nearby, on lots previously dedicated to parking. Other areas will be designated for a tech campus, and a separate science and technology university. 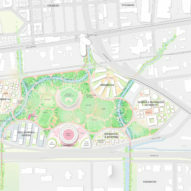 "At the heart we create a new resilient central park for East Oakland, anchored by the two focal points of Oakland sports history," said BIG. While the Oakland A's won't be moving far, the Oakland Raiders NFL team is relocating to Las Vegas, where a 65-seat stadium was proposed to entice them. BIG has also designed sports venues in two other US cities: a chequerboard-covered complex for concerts and rodeos in Austin, Texas, and a stadium for the Washington Redskins in DC.